The Canadian Boat to Gaza, the “Tahrir,” attempted to set sail for the Israeli-occupied Gaza Strip today from the port of Agios Nikolaos, on the Greek island of Crete, but was quickly intercepted and boarded by the Greek Coast Guard. 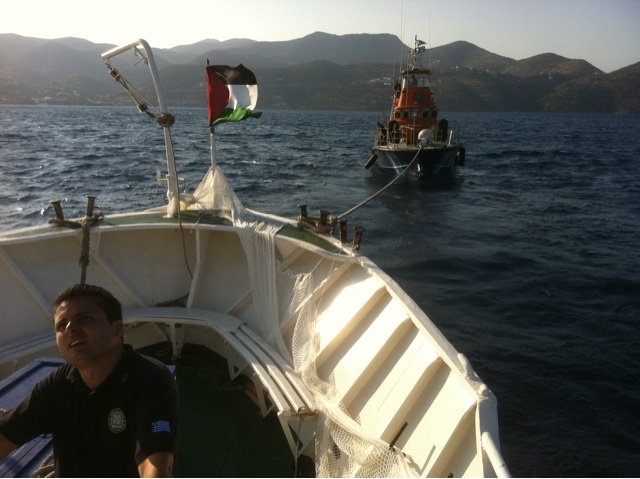 Despite nonviolent resistance, the Greek Coast Guard took control of the boat and it was towed back to port. The boat has left port. But a short time later passengers reported that the Tahrir was being approached by speed boats and was boarded. Greek coast guard sendingn zodiac. they may try and board us. Our boat has been boarded by the coast guard. 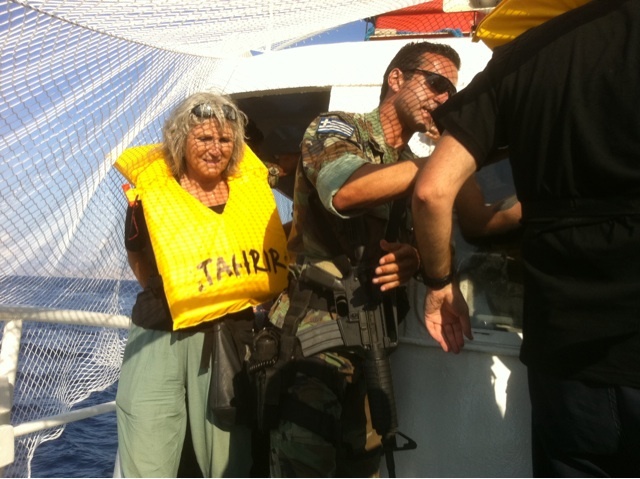 We still have control of the Tahrir, but Greek coast guard is trying to take control. We're resisting nonviolently. This is our boat! Nobody injured in Greek takeover of Cdn boat to Gaza. Delegates non violent in blocking wheel house. We got about 5km away from shore. Greek authorities have taken over the boat and appear to be heading back to port. Boat being tied at port now. Crowd greets boat. Will there be arrests now? people in the port are chanting support for the #tahrir, "let them go, free palestine"
As the coast guard borded and took the wheel room, activist chanted " you are working for Israel, the Greek people don't support this"
Organizers report that their boat has been damaged. Very serious situation developing. Gas leaking. Greek coast guard slammed boat into concrete pier. Details to follow. Extreme damage suffered by Tahrir when slammed into concrete wall when commandeered by Greek coast guard and forcibly returned to port. Update:damage to diesel tank caused by Geek Authorities when they slammed the Tahrir into a concrete wall BUT the boat is not sinking. Article 13.2 of the Universal Declaration of Human Rights states that “Everyone has the right to leave any country”. Preventing flotilla ships from leaving Greek ports is a clear violation of this human right. “Greece has no right to detain foreign-flagged ships in its ports other than for purposes of assuring seaworthiness via timely inspection. And they cannot interfere with ‘innocent passage’ through their territorial waters, and this passage is definitely innocent,” said Richard Falk, American professor of international law and an appointee to two United Nations positions on the Palestinian territories. “Greece’s position is disturbing but this should not divert our attention from Israel and its illegal and inhumane blockade of Gaza. Israel is the source of the problem and it will be held accountable by the international community – sooner or later,” said Sandra Ruch, from the Tahrir steering committee. Support actions have been and continue to be held at Greek consulates all over Canada (as well as in cities all over the world) calling on the Greek government to end its support of the Israeli blockade of Gaza and immediately lift the blockade it is imposing on the Flotilla boats from Greece’s ports. Let the boats go to Gaza! They're stopping them one at a time... sad. Free Palestine! These people do not represent the majority of Canadians and do not create our foreign policy.